Worried about your DJ's typing skills? RadioActivity has built-in error correcting for common mistakes, auto-discovery for missing fields, and a rich suite of both live-logging and after-the-fact correction tools to make sure your playlists are as complete, accurate and error-free as they can be. RadioActivity's auto-suggest feature saves essential time in the booth by suggesting data as your DJ's type. Think of it as predictive text for your playlists - real time, intelligent auto-completion based on your DJ's entry. Worried about your station staying compliant with the "sound recording performance complement"? RadioActivity will automatically warn your DJ's and MD's - internally - when playlists exceed the limits set by these rules. What's more, we'll keep RadioActivity up-to-date with whatever future playlist rules may come into being. 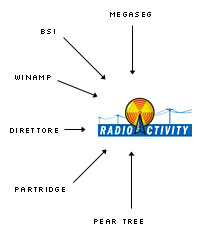 Because RadioActivity is web-based, there's no hardware or software to install. Stations manage their data via a secure, web-based interface compatible with all modern browsers, from anywhere there's an internet connection. If you are logging by hand, RadioActvity can easily save your station a ton of paper. If you're looking to make your station a little greener, ditching your paper playlists is a great place to start. All of your data is stored in the RadioActivity servers, backed up offsite every week, and available to you 24/7/365. Stations can also, at any time, download a full copy of their data onto CD or DVD. Once your DJ's are reporting their playlists, getting those playlists to appear on your station's website is a simple matter of cut-and-paste, because RadioActivity integrates with your station's site via XML and RSS. And if you have a website - but not a webmaster - we'll gladly help you with RadioActivity integration. ... can all 'talk' to RadioActivity, and we're bringing more online as fast as we can. RadioActivity also talks to Twitter, and can tweet your station's playlists in real time. Worried about the content being syndicated to your station website? Want to blank out the seven dirty words? RadioActivity includes feed filters to mask, delete, or replace any 'bad words' you don't want to appear in your station's public feeds. The raw report data is never changed - only the public-facing data. Is your station AM? No problem. We own radioactivity.am too. What's more, once your show playlists are available on the web, they opens up a whole new avenue of artist-to-DJ communication, as artists encounter their works in your station's playlists. Direct station-to-artist relationships are becoming more important - especially for webcasters - and RadioActivity.fm helps foster that communication. We're working on a RadioActivity developer API to let interested parties extend and expand RadioActivity's offerings. This business contains a lion's share of visionaries and techno-savvy broadcasters, and we'd like to work with them. If you're looking for more features, or to discuss some interesting playlist-related tools, we invite you to contact us with your information and suggestions.